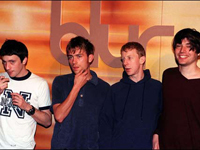 Initially, Blur was one of the multitude of British bands who appeared in the wake of the Stone Roses, mining the same swirling, pseudo-psychedelic guitar pop, only with louder guitars. Following an image makeover in the mid-’90s, the group emerged as the most popular band in the U.K., establishing themselves as heir to the English guitar pop tradition of the Kinks, the Small Faces, the Who, the Jam, Madness, and the Smiths. In the process, the group broke down the doors for a new generation of guitar bands who became labeled as Brit-pop. With Damon Albarn’s wry lyrics and the group’s mastery of British pop tradition, Blur was the leader of Brit-pop, but they quickly became confined by the movement; since they were its biggest band, they nearly died when the movement itself died. Through some reinvention, Blur reclaimed their position as an art pop band in the late ’90s by incorporating indie rock and lo-fi influences, which finally gave them their elusive American success in 1997. But the band’s legacy remained in Britain, where they helped revitalize guitar pop by skillfully updating the country’s pop traditions. Originally called Seymour, the group was formed in London in 1989 by vocalist/keyboardist Damon Albarn, guitarist Graham Coxon, and bassist Alex James, with drummer Dave Rowntree joining the lineup shortly afterward. After performing a handful of gigs and recording a demo tape, the band signed to Food Records, a subsidiary of EMI run by journalist Andy Ross and former Teardrop Explodes keyboardist Dave Balfe. Balfe and Ross suggested that the band change their name, submitting a list of alternate names for the group’s approval. From that list, the group took the name Blur. “She’s So High,” the group’s first single, made it into the Top 50 while the follow-up, “There’s No Other Way,” went Top Ten. Both singles were included on their 1991 Stephen Street-produced debut album, Leisure. Although it received favorable reviews, the album fit neatly into the dying Manchester pop scene, causing some journalists to dismiss the band as manufactured teen idols. For the next two years, Blur struggled to distance themselves from the scene associated with the sound of their first album. Released in 1992, the snarling “Pop Scene” was Blur’s first attempt at changing their musical direction. A brash, spiteful rocker driven by horns, the neo-mod single was punkier than anything the band had previously recorded and its hooks were more immediate and catchy. Despite Blur’s clear artistic growth, “Pop Scene” didn’t fit into the climate of British pop and American grunge in 1992 and failed to make an impression on the U.K. charts. Following the single’s commercial failure, the group began work on their second album, Modern Life Is Rubbish, a process that would take nearly a year and a half. XTC’s Andy Partridge was originally slated to produce Modern Life Is Rubbish, but the relationship between Blur and Partridge quickly soured, so Street was again brought in to produce the band. After spending nearly a year in the studio, the band delivered the album to Food. The record company rejected the album, declaring that it needed a hit single. Blur went back into the studio and recorded Albarn’s “For Tomorrow,” which would turn out to be a British hit. Food was ready to release the record, but the group’s U.S. record company, SBK, believed there was no American hit single on the record and asked them to return to the studio. Blur complied and recorded “Chemical World,” which pleased SBK for a short while; the song would become a minor alternative hit in the U.S. and charted at number 28 in the U.K. Modern Life Is Rubbish was set for release in the spring of 1993 when SBK asked Blur to re-record the album with producer Butch Vig (Nirvana, Sonic Youth). The band refused and the record was released in May in Britain; it appeared in the United States that fall. Modern Life Is Rubbish received good reviews in Britain, peaking at number 15 on the charts, yet it failed to make much of an impression in the U.S.
Modern Life Is Rubbish turned out to be a dry run for Blur’s breakthrough album, Parklife. Released in April 1994, Parklife entered the charts at number one and catapulted the band to stardom in Britain. The stylized new wave dance-pop single “Girls and Boys” entered the charts at number five; the single managed to spend 15 weeks on the U.S. charts, peaking at number 52, but the album never cracked the charts. It was a completely different story in England, as Blur had a string of hit singles, including the ballad “To the End” and the mod anthem “Parklife,” which featured narration by Phil Daniels, the star of the film version of the Who’s Quadrophenia. With the success of Parklife, Blur opened the door for a flood of British indie guitar bands who dominated British pop culture in the mid-’90s. Oasis, Elastica, Pulp, the Boo Radleys, Supergrass, Gene, Echobelly, Menswear, and numerous other bands all benefited from the band’s success. By the beginning of 1995, Parklife had gone triple platinum and the band had become superstars. The group spent the first half of 1995 recording their fourth album and playing various one-off concerts, including a sold-out stadium show. Blur released “Country House,” the first single from their new album, in August amidst a flurry of media attention because Albarn had the single’s release moved up a week to compete with the release of “Roll With It,” a new single from Blur’s chief rivals, Oasis. The strategy backfired. Although Blur won the battle, with “Country House” becoming the group’s first number one single, they ultimately lost the war, as Oasis became Britain’s biggest band with their second album, (What’s the Story) Morning Glory?, completely overshadowing the follow-up to Parklife, The Great Escape. While The Great Escape entered the U.K. charts at number one and earned overwhelmingly positive reviews, it sold in smaller numbers, and by the beginning of 1996, Blur was seen as has-beens, especially since they once again failed to break the American market, where Oasis had been particularly successful.